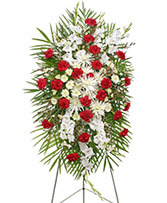 You can send flowers from CR Flowers & Balloons ~ A Bracebridge Florist to any funeral home listed below. Please refer to this list for the names, addresses and phone numbers. Let CR Flowers help you through a difficult time. We can help you say good bye to that special person, or say I am thinking of you to the family members left behind. CR Flowers will design something just for you! Classic, fresh-cut red roses with accents of eucalyptus and other fresh foliage are featured in this beautifully-traditional spray. 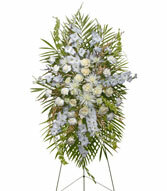 Let CR Flowers & Balloons ~ A Bracebridge Florist deliver a lovely floral expression of sympathy and reverence for you.